The subject of this portrait has traditionally been identified as a young woman of Spanish descent who cared for Gustave Courbet in the fall of 1854, when the artist caught cholera after visiting the art patron Alfred Bruyas in Montpellier. Nursed back to health in Lyon with what he described as a radical remedy, Courbet may have painted the young woman's likeness when he returned to Paris. (Beneath this portrait is a painting of the head of another woman, oriented differently, suggesting that he reused a canvas lying around his studio.) Leaning on her arm and running a hand through her hair, the woman exudes a languid sensuality not uncommon in Courbet's female portraits. Exhibited at the combined Salon and Exposition universelle of 1855, the picture attracted more attention---most of it negative---than any of his other ten paintings on display. Critics disapproved of Courbet's realism, arguing that it made the woman appear ugly, and they wondered what grievances he held against Spain. She was even likened to Russian leather in a print caricature that circulated in Paris. Jennifer A. Thompson, from Masterpieces from the Philadelphia Museum of Art: Impressionism and Modern Art (2007), p. 40. Gustave Courbet showed eleven paintings, including some of his largest and most ambitious works, at the enormous art exhibition associated with the Exposition Universelle in Paris in 1855. It was this relatively small, straightforward depiction of a Spanish woman, however, that attracted the most scathing criticism. One critic declared the sitter a victim of Parisian dissipation, while another wondered why she was so swarthy and haggard. 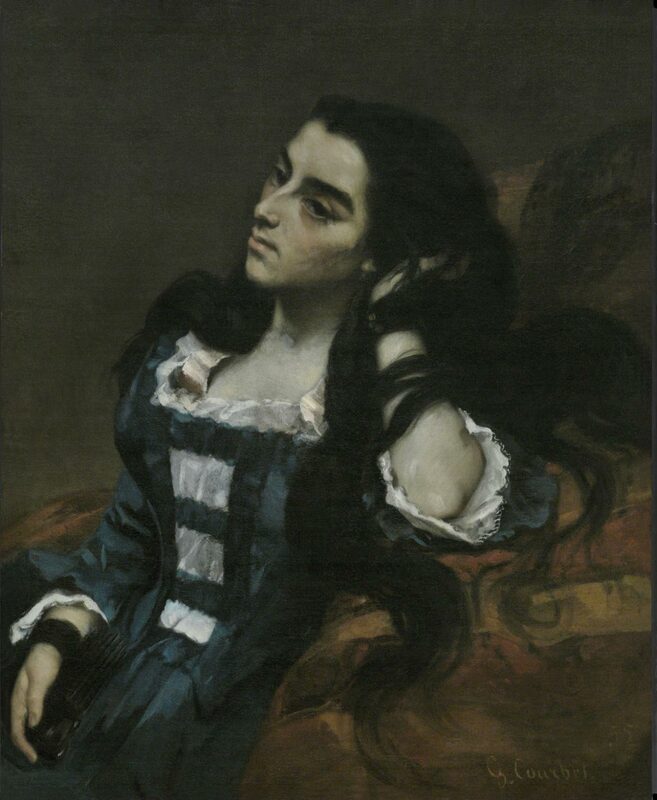 In fact, her meditative and sensual pose, fingers entwined in cascading hair, derives from an impeccable Renaissance prototype, and such depictions of national "types" were by no means novel in Courbet's time. Rather the directness of paint handling and vivid contrasts of bright and somber colors, with their anticipation of Edouard Manet's art a decade later, may have struck an uneasy note with the critics who sensed that traditional modes of painting and canons of beauty would henceforth be under siege. The sitter may have been a Spanish woman whom the artist had met in Lyons in 1854. Visible by X ray underneath is a completed half-length portrait of another quite different woman. Christopher Riopelle, from Philadelphia Museum of Art: Handbook of the Collections (1995), p. 192.